It is interesting to contemplate a tangled bank, clothed with many plants of many kinds, with birds singing on the bushes, with various insects flitting about, and with worms crawling through the damp earth, and to reflect that these elaborately constructed forms, so different from each other, and dependent upon each other in so complex a manner, have all been produced by laws acting around us. …Thus, from the war of nature, from famine and death, the most exalted object which we are capable of conceiving, namely, the production of the higher animals, directly follows. There is grandeur in this view of life, with its several powers, having been originally breathed by the Creator into a few forms or into one; and that, whilst this planet has gone circling on according to the fixed law of gravity, from so simple a beginning endless forms most beautiful and most wonderful have been, and are being evolved. At the close of his masterwork, Charles Darwin confronts the metaphysical implications of the argument elaborated in the preceding pages in a brief yet profound image: though the theory of evolution by means of natural selection deprives an all-powerful deity of responsibility for nature’s infinite variety of creatures, another sort of grandeur inheres in this vision of nature. As much a work of literature as of science, the narrative explanation of the origin of species synthesized Darwin’s observations, gathered over decades, from England to South America, West Africa, Australia, and the extraordinary biodiversity of the Galapagos Islands, into one great system. It is now thought that the tangled bank analogy was inspired by a hillock near Darwin’s family home in Kent, on which he could see the operation of all of nature’s laws which he had witnessed at work in ecosystems around the world. It would come as a surprise to Darwin that he was not alone in discerning the expression of an underlying logic across diverse and geographically disparate environments—an honor that he shared with fellow colonial English naturalist Alfred Russel Wallace. Similarly influenced by the gradualist theories of change of Charles Lyell, Jean-Baptiste Lamarck, and Alexander von Humboldt’s, Wallace drew his conclusions from the Malay Archipelago or present-day Indonesia, Singapore and Malaysia—observations of which he would eventually publish with a touching dedication to Darwin. This striking case of friendship born of simultaneous discovery testifies to a spirit of humanism undaunted by an account of human origins that seemed to contravene the special dignity accorded to our species. The need to reconcile humanity’s benevolent dominion over the earth with an image of nature “red in tooth and claw” weighed heavily on the conscience of both naturalists, perhaps even more so for Wallace, who derived his theory from a region whose human communities were frequently inundated by earthquakes and violent volcanic eruptions. Ever Since We Crawled Out brings together a collection of new works by Julian Charrière that explore these enduring questions within the context of twenty-first century geographies of human impact upon earth systems. At a historical moment in which the nominal species-agent Anthropos has been elevated to the status of a geological force, with catastrophic consequences for other species and the delicate ecosystems we share with them, the abstract principles latent within exemplary historical landscapes bear rereading. On the floor of the gallery lies a great plank of charred topical wood, its blackened surface inscribed with a montage of Wallace’s botanical drawings, a tangled pattern of plants and birds variously magnified to lifelike proportions.To Observe is to Influence (2018), a truism of microphysics, resonates here as a dark cautionary tale in the ecological domain. A short film, which gives its title to the exhibition, proffers a speculative explanation of this archive of desecration. On the slopes of the Tambora volcano, on the island of Sumbawa, Indonesia, the foliage is low and sparse. The rare, tall old tree stands out in the distance, offering a point of orientation on the long climb. One wonders whether it was spared by the fires and landslides of molten rock that stripped this mountain bare two hundred years ago, in April 1815, in the largest volcanic eruption in recorded history, an event which still leaves the surrounding region strewn with football-sized boulders and its beaches littered with carbonized tree trunks. Charrière and I were drawn to visit Tambora’s immense crater in August 2017 by stories of its effects felt all the way around the world. The eruption was powerful enough to inject a cloud of superheated gasses and the ashes of an incinerated mountain peak into the upper atmosphere, where they were dispersed by stratospheric winds. By the following year, the increased concentration of sun blocking particles in the atmosphere was sufficient to reduce the earth’s average mean temperature by one degree Celsius, plunging regional climates into chaos for three years to come. Cold and darkness descended mysteriously upon the Northern Hemisphere, even as the Arctic warmed and disturbances of the monsoon wrought flooding and drought across China and Southeast Asia. The volcanic cause, and true extent, of this global climate cooling crisis was not fully understood until the late twentieth century (after the Mount Pinatubo eruption produced similar effects). This insight contextualized a pair of particularly memorable episodes that took place in the Swiss Alps during the same period: the conception of Mary Shelley’s novel Frankenstein, Or: The Modern Prometheus (1818) amidst the dawning atmosphere of terror of the “year without a summer” of 1816, and the tragic flooding two years later of Lake Mauvoisin, caused by unseasonal growth of the Giétro Glacier. Returning to Tambora on the bicentenary of these events, amidst another climate crisis, we had also had reason to consider whether the ravages evinced by this landscape were wrought by human hands. On our trip to the seismic monitoring station at Tambora’s base we learned that the volcano’s name may be translated as “an invitation to disappear,” a haunting moniker for mountain wreathed in clouds that would eventually lose half of its height; or, perhaps, an unfriendly epithet directed at the former inhabitants of a kingdom annihilated by the eruption. There also fell into our hands an old Swedish documentary, which chronicles the establishment of a coffee plantation on Tambora’s slopes, an exhibition of colonial progress achieved by systematically clear cutting of old growth forest. Ever Since We Crawled Out features the moment felling of great trees culled from a century of found film and video footage, a relentless visual repetition of individual instances whose cumulative effects are well known: deforestation, habitat loss, the deprivation of indigenous communities of traditional means of subsistence, destruction of important carbon sinks. Having emerged triumphant from the “war of nature,” we’ve slashed and burned the tangled bank, disturbing the delicate equilibrium embodied within it, and replacing its inner logic with imperatives of our own innovation. An Invitation to Disappear (2018) is a filmic and photographic expedition into the heart of a lush dystopian landscape symptomatic of the current derangement of global ecological systems. Entranced by a vague sense of promise, the camera slowly traverses a turbulent cloud, which gives way to reveal row upon row of oil palms, heavily laden with fruit, and spreading out in every direction. As the waning light of dusk penetrates the forest’s thick canopy, the grid cast on the ground by the sun’s last flickering rays is replaced by flashes of light deep in the distance. Blending with the sounds of the forest, a low rhythmic techno beat is felt before it is heard, inducing a sense of direction within the nauseating infinity of the grid. Drawn steadily towards a dark mirage by the rising sound, the camera moves slowly through the darkness until it happens upon a scene of jubilation. An enormous sound system is illuminated between flashes of strobe light. In the conspicuous absence of people, a party rages with mesmerizing intensity. 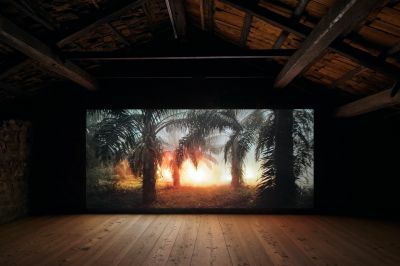 Riveted by the scene, the camera moves slowly straight through the row of palms in a seemingly interminable shot, broken only by the smothering effects of gusts from seemingly autonomous smoke machines. As the night wears on, delirium sets in; the base pounds relentlessly upon the deaf ears of the monoculture planation, endlessly deferring an implied climax of collective consciousness. The dim light of dawn cuts through palm fronds, blinding the camera momentarily in a swirling mist, through which the expedition resumes in an infinite loop. Set in an oil palm plantation at an unmarked location, a nowhere that could be anywhere in Indonesia or Malaysia, where most of the world’s palm oil is produced, the film stages a disturbing confrontation with the conflicting promises of two global monocultures: rave culture and industrial agriculture. Can beauty be found here? Is there still grandeur in this landscape and the laws it evinces? An enormous glass cylinder contains its valuable harvest, omnipresent in foods, cosmetics, and even biofuels. Illuminated, the red liquid bubbles up slowly through Love-In Krakatao (2018), an enormous palm oil lava lamp, casting a golden glow through the gallery, visually softening the aggressive mechanical whir that pervades the space. On the wall, a belt-sander apparatus created using volcanic debris from Indonesias' Mount Gurung Merapi and Anak Krakatau, reasserts an irresolvable tension between the creative and destructive tendencies inherent in nature and our own.